An overlooked pioneer of the Modern Movement in architecture, this Irish artist, furniture designer and architect spent most of her working life in Paris, only receiving recognition in the late 1960s. Born in southern Ireland, Gray studied at the Slade School of Art and then moved to Paris. It was here that she began designing furniture as well as moving into architecture. Her most famous design was the leather and tubular steel Bibendum chair, which was in keeping with the modernism of contemporaries such as Le Corbusier and Mies van der Rohe. She also designed carpets, lamps and tables, including the E1027 table for her design of the E1027 modernist villa in the south of France. An original Gray Dragon Chair recently sold for $28 million - a record for modern furniture. The E1027 villa is often cited as the first modernist house ever created and it has been the centre of controversy almost ever since. Gray ceased living there in the early 1930s and later in the decade Le Corbusier defaced the interior while staying as a guest. He subsequently built a cabin close to the villa and did all he could to denigrate Gray's contribution to the house. The house was also looted during World War II and a subsequent owner murdered in the house. After falling into disrepair, the house is now the subject of a controversial renovation. The house will be the central location in a film about Gray, The Price of Desire, featuring Alanis Morissette. 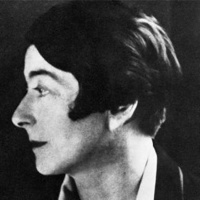 Despite the instant success of her designs, Eileen Gray’s contribution to 20th century design was largely forgotten after the Second World War. This may have been due to a combination of her open bisexuality and her increasingly reclusive existence after 1945. However, she was rediscovered in the late 1960s and is now considered an important figure in 20th century modernism.